Bichos Argentinos #2 – Pseudomyrmex sp. One of the insects I tracked at La Reserva Ecológica Costanera Sur in Buenos Aires, Argentina last weekend was this twig ant in the genus Pseudomyrmex. I had noticed these slender, wasp-like ants previously on trips to the U.S. desert southwest, but it wasn’t until I read a couple of recent posts about them at Myrmecos and 6legs2many that I knew specifically what they were. Alex characterizes these ants as “delightfully gentle, quirky little insects.” What he didn’t mention is how frenetic and unceasing they are as they forage amongst the shrubbery. I must have taken a couple dozen shots of several individuals over the course of the day, deleting every single one on the spot because I couldn’t get a clear, close, focused, nicely composed, unobstructed image. Their habit of crawling rapidly along slender twigs is problematic enough, with little opportunity to brace the camera against anything steady and spend time composing the shot. Add to that the frequently thorny nature of the trees they were roaming and their annoying habit of darting around to the backside of whatever twig they were on whilst trying to follow them in the viewfinder, and I almost decided I’d met my match and could do without the shot. In the latter part of the day I encountered this individual, and as I already had my 65mm lens mounted I decided to give it another try. I can’t say that I actually figured out the secret to getting the shot, but rather that I just lucked out and happened to have hit the shutter release at just the right moment – and with reasonable focus – as I tracked the ant along the branch on which it was crawling. It was the only shot of one of these ants that stayed on the card that day. The genus is huge, with 209 species occurring primarily throughout the Neotropics. As a result, it would be foolish for me to even attempt a species ID. 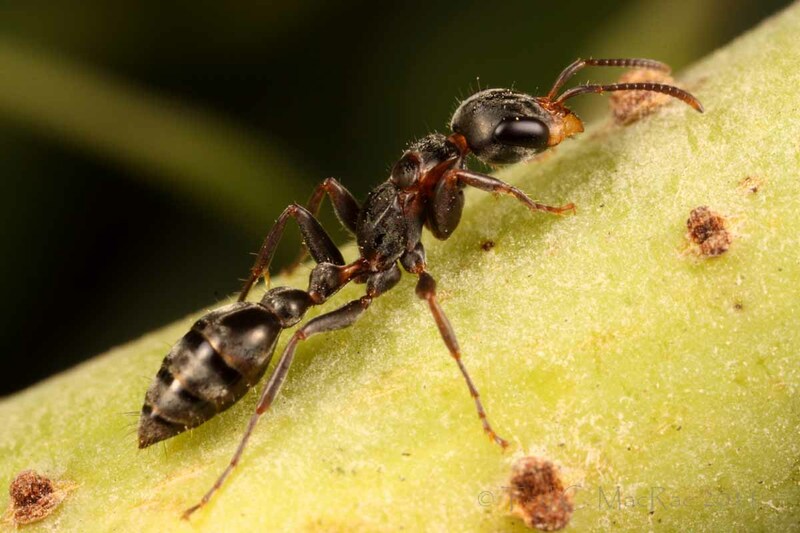 Still, I can’t help noticing its great resemblance to this photo of Pseudomyrmex phyllophilus, taken by Alex in – you guessed it, Buenos Aires, Argentina. I’ll wait for the correction, but in the off-chance that I’m right I think I deserve points on somebody’s scorecard! This entry was posted in Formicidae, Hymenoptera and tagged ants, Argentina, entomology, insects, nature, science. Bookmark the permalink. 12 Responses to Bichos Argentinos #2 – Pseudomyrmex sp. Nice one, Ted. That’s Pseudomyrmex gracilis, one of the larger & hairier species. P. gracilis is most likely a complex of species, but until Phil Ward sorts it out we’re all just lumping them. A brightly-colored red/black version (“gracilis mexicanus”) of this species has been introduced to Florida. I’ve found it helps to hold a hand on the opposite side of the branch when photographing Pseudos, as that sometimes spooks them around to hide on the lens side. Still, they’re not that easy. Thanks for the ID Alex. I learned the “hand behind the branch” trick some time ago but don’t have it perfected yet (hard to hold the camera one-handed!). It gives me even greater appreciation for the shots you are able to achieve. Oh, and to tell the difference between gracilis and phyllophilus, have a look at the shape of the petiole, as well as the difference in overall pilosity. Cool – I actually did note the differently shaped petiole (but not the pilosity) when I was comparing my photo to yours. It was enough to give me a sneaking suspicion that a correction would be forthcoming. Alex beat me to it on the ID, but I’d also add that Ps. gracilis is a good bit larger than most other “pseudos”, around 10 mm+ in length, while the more “normal” range is about 4-7mm. Another thing, Ant Web claims to list 209 species in this genus, and this of course doesn’t count the various cryptic or otherwise undiscovered ones in the gracilis and other species groups. Nonetheless, you still get points for a decent picture of a difficult subject, especially since it’s in the Formicidae! All of the individuals I tried to photograph that day were similar in size and appearance to this one, although its possible there could’ve been multiple species involved. Hmm, don’t know where I got the number 133, as the page I linked to definitely says 209. Oh well, correction noted and made. I think its fair to say that we all assume any genus with this level of diversity or higher hasn’t yet revealed all of itself to us. Imagine the knowledge still hidden in one of the genera that I deal with – Agrilus – which now contains more than 3,000 species and may well be the largest genus in the entire animal kingdom! The really big ant genera are Pheidole, (at least 1000 spp in the New World alone, and half or so of that elsewhere?) and Camponotus, (no idea, but perhaps rivaling Agrilus, unless someone decides to break them up somehow, but the current state of our knowledge about them doesn’t tell us much about how that might be done). Same situation with Agrilus (and I suspect most other “supergenera”) – they’re not really that big, we just haven’t figured out how to dissect the relationships. I think you did a great job photographing a notoriously difficult family of insects. Ants…to me are without a doubt one of the most difficult insects to capture clearly in a photo. They never stop moving….I think the saying “busy as a bee” needs to be changed to “busy as an ant”. While it doesn’t have quite the ring to it, it sure is accurate. Good job! The ant is beautiful and you did a great job showing that! Aw, thanks Shelly! It seems most insects have their challenges for photographers, whether it unceasing movement, extreme wariness, brilliantly smooth integument, etc. Half the fun in insect photography is overcoming the challenge!